/ How do I change the owner’s name on my Mac? How do I change the owner’s name on my Mac? Change that and close the window and you should change the computer name . You’ll want to set yourself up as an admin account if you don’t already have that, and you can also click on the “Login Options” and change it so that it’s your account that’s the default login account when you start up the computer. If you just have a regular user account, I would suggest you set up a second account that’s an admin account. Anyway, between these two areas, you should be able to purge your computer of their identity and finally have it all to yourself! My daughters old college mac ended up with my ex. He got all his info on it, then I took it over. My tech said not to even try to change it as I’d lose all the files and stuff I’ve collected while using it in his name. Recently transferred everything to a refurbished mac. Same problem. And since we both moved, his old email and password is no longer valid. (Guess I should’ve gotten a new one) but I’d still be losing all my pics, downloads, etc. Really stuck, old and not tech savvy enough. If you have an external unit and copy everything onto it then move to a new computer, you should absolutely be able to copy everything back onto the new computer and access it. I suggest you check in with GeekSquad at the local BestBuy or similar to have someone help you through this process, Carol! after changing the Admin username and password of my 2nd hand mac, it says i need to restart. as i restart, the username and password i had created did not work. and even keying in the old username and password is not working. im stuck in a black screen asking for username and password. pls help. I recently recovered my stolen Macbook – Mac OS X but need help making changes bc I do not know the previous user’s password. What can I do? Josephine, I’d wipe the hard drive and reinstall the OS and apps from scratch. You just never know what they’ve done or what malware they might have dropped onto the system. Good luck! How do I do that without the administrator’s password? I changed the name as well due to a divorce but now when I log back in I lost ALL pictures, ITunes , etc…. HELP!! At this point it should restart the laptop itself. When it’s finished, you should get your old files, information etc… back again. Hope that helps, as it also happened to me once. Hi Dave, Me and my friend planing to exchange our mac book pros, how should we do it? is there any ownership change required legally to get all apple services in the future for both of us? I need help. I bought a sample floor imac from best buy and when i go to users i can see the name of BUY as a main user. i cannot change the name of BUY into my name. please help. I too have separated from my wife and she set up this macbook pro with all her details I have changed what I can to generic name but the files section with the little house Icon still has her name….. how do I change that as when I click on it and select info it shows a text box but its greyed out and I can’t change the file name. This was *very* helpful. Thanks very much! Thank you very useful and easy to do. I recently bought a MacBook Air with OS X Lion. I have been trying to change the default name of the owner from ” MacBook Air” to “MyName”. After a bit of browsing around for the solution, I have found the following 3 steps to take care of the Name Changing business. 1) Go to System Preferences–Systems–Users & Groups. Edit the default admin user name, password and picture to something of your choice. This will take care of the login screen. 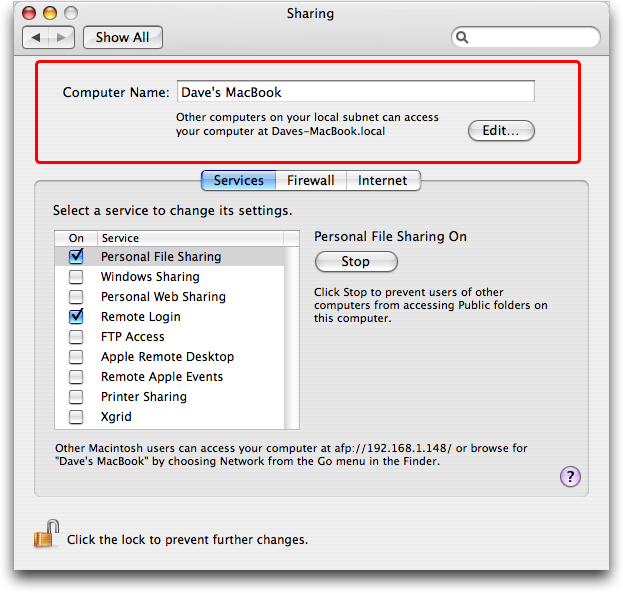 2) Go to System Preferences–Internet & Wireless– Sharing. Edit “Computer Name” to one of your choice and also click on the ‘Edit’ button on the right. Now you can edit the “Local Hostname” to one of ur choice. This step takes care of what others in a LAN/WAN setting see ur computer name as and it also updates the new name in some places. 3) Inspite of doing the above mentioned steps, you will still see the old name next to the “Home” icon on the side bar, under users and a few other places. To change this, go to the Address Book, click on the default contact (the one with the “PP size” silhouette of a person), edit it and put a name of your choice. Make sure, the new name has been saved. 4) Now shut down your machine and when you restart all traces of the previous owner/ user should hopefully be erased from the system. 5) Go to MS Word, Exel, PowerPoint, etc and go to their preferences and change the owner name / initials to one of your choice. I think this more or less covers all tracks for a lay person. Hi Dave, I’ve changed a lot on my puter already from the advice from you and in previous posts from others but there is still one thing I cant seem to change…. I’ve erased my exes name from every place on my puter except when i open finder, on the left it lists Devices, Places, & Search for… Under the Places category it says -Desktop -Applications -Documents -“Exes Name”….. How do I erase or change that? That’s not pretty, Josh. What I’m thinking is that the easiest path is if you can get to the System Preferences, create another administrative account (e.g. another user account with admin privileges), then specify that as the default account when you log in. Then you should be able to just copy all of your old content (if you have any still around) to the new account, change ownership of those files, and be good to go. I bought a used MBP and tried to rename the HOME folder, I accidentally deleted the home folder. Is this a fix that I can do or is this something that I have reinstall 10.7? How do I get my computer back to where it was before I started trying to make changes?… (the folder has all of my stuff-music, pics, etc-in it but when i log out of “root” and log in to “me” nothing is there. HELP???! Addendum: after enabling root access sign out of the administrator account and sign into “other.” type “root” as the username, and then enter whatever password you set for the root account. in finder search for the folder called “users” and open it up. Dave, thanks for all your help, This is exactly what I was looking for. I do have one thing to add to Jose Gonzalez’s post. I am running OX Lion (10.7.2) I was unable to find directory utility in the utilities folder, but after searching around for a bit I found that a different way to get into directory utility. from there you can click edit in the apple menu bar at the top of the screen/ enable root access/ and change your password. There is actually way to change the name of the home directory without re-installing the mac os x. You have to log in as root instead of a normal administrator log-in. To do that, go to the utilities folder and open the ‘Directory Utility’. Once there go to Edit (on the upper task bar) an press ‘Enable Root’. It will ask you to create a password. Once done, log out. once logged in, go to home>users and highlight the folder that you would like to change the name (which is the one of the home directory). Once you highlight it, go to File>Get Info>Name & Extension there you will see that you can change the name. This method only works with the Mac Os X, for earlier version is some what a different method if I’m correct. Hi Dave your site does help very much thank you. However, I have a prob that was so stupid of me and I have been trying to figure out what exactly I did and how to fix. There were many other users listed on my iMac and I just wanted to have myself and 1 called other…. but I believe stupid me deleted all files in for instance the guest user home folder. So there is no applications, downloads or documents on the user – other. Please help me if you can ..very much appreciated. Thanks for the reply…yes it is actually microsoft office I noticed still carried the old owners name when saving files. Is this easily changed? I have been able to change the password of the administrator, but cannot for the life of me figure out what the name of the administrator is!!!! i have changed the password and password hint somehow. I am clearly not mac savvy. PLEASSSEEE HEELLPP ME!! i can’t update my computer at all because i dont know the admin name. and everything is locked so i couldnt create a root user. Dave, my mom died in May and my family gave me her computer. I thought I knew her password but it isn’t working. When I tried the above measures it didn’t work because in order for anything to be changed it required her password. How do I change the computer to my name and get around this? Please help. I keep typing in what I thought her password is but it doesn’t work – is it case sensitive too? I have changed all the settings to my Name. How do I get the ‘Home’ folder to change? It still has the previous owners name? Thanks dude… just what I needed!!! I have a mac with OSX but it was under my ex’s name. I followed one of the suggestion on this page (the one by Jose R. Gonzales). I created a root account and logged in through there and then changed the name. it seemed to work at first but when i logged back in to my personal account all my original settings were gone. I had programs such as word and iWork installed in my computer and now there no where to be found. Is there any way I can undo what was done? i would rather have my ex’s name on the computer than all my programs and original setting deleted. Here is my problem, A friend of mine old me some money I loan him to fix his car, well that’s been 9 months ago. So for payment he gave me a nice MacBook Pro, well this was also given to him by his ex-girlfriend, so all he has his her name and every time I try to do something her name always pops up and below ask for a password, How can I change all this and put this in my name, I have always been a windows user but this mac is growing on me and I would love to keep it, your help would be great. Thanks so much.. There is also the “Me” Card that is made when you first register your computer. I inherit Macs regularly through the company I work through. If you click on the “Address Book Card” Open button. This pulls up the contact that is registered with the Mac. I don’t see a way to change the “Me” card to another contact, but you can edit this special card to fit your own name and contact information. Once you do this, then Software Registration, iCal events, etc will all be correct. I bought a used macbook and the home’s name is under the first owner, also with log in’s of mobile me and more, an the registration to the site is also under his, what can i do about this? Hey! Thanks soooo much. I just got this macbook 3 hours ago from a friend, and I am trying to change her name to mine for 2.5 hours now. Checked out all the helpful sites on the web. Tried everything but can’t change one – the hard drive’s name. Until from your very very simple instruction – which did it! Thanks again. I can sleep now. Thanks a lot for your help in changing the ownership name on my MAC. The man i bought it from just wanted to fill it up with microsoft! I helped him out and bought it cheaply from him. THanks again. Apparently, there’s a freeware program called ChangeShortName that will change a user’s short name. Haven’t used it (yet), but thought I’d post before I forget. i bought a used macbook I can set up account with me as admin changed book name thanks to you but I too have the original owners name and shortname that icant change is it ok to just deleat the user with the old short name? it seems to pop up like a ghost every where how important is it? okay so i did what you said in this but i don’t have the option to change the short name from my name to my dads, see i gave my macbook to my dad, cuz he has been helping me alot. And i already had a hp notebook, i just need to know how to change from ym name to my dads name when i don’t have the option to change the short name????? please help.. He doesn’t want any of my files deleted he wants to keep them..
Great Stuff, Quick Easy and always get the answers im looking for. Cheers Dave!! BRILLIANT work. Did not know how to do this. Thank you. Thanks to you for answering my own question, and to Google for helping me find this webpage! I’m setting up an old G4 to try to sell, and didn’t know how to get my name off of the thing. Here’s a related question – I want to change my user “home” address. I was too quick with the OK and now the computer thinks my home is in Washington. Also, if I move…you get the idea. Any thoughts? Try checking the keychain and in Safari preferences. I recently married and changed my name but my Apple dseems not to realize that. I have changed my name in the Sharing section and under Accounts, but it still seems to think my maiden name is the primary name. For example, I recently set up a secondary account on my .mac email and it automatically filled it in as my maiden name. It took me two weeks to realize! And when I fill in forms on web sites, it automatically fills them in with my maiden name too.